La Rioja is a province and autonomous community of northern Spain. Its capital is Logroño. 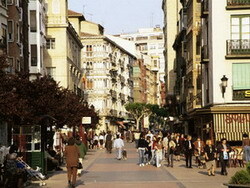 Other cities and towns in the province include Calahorra, Arnedo, Haro, San Asensio, Navalsaz, and Nájera. It is bordered by the Basque Country (province of Álava), Navarra, Aragon (province of Zaragoza), and Castile and León (provinces of Soria and Burgos). The Río Ebro flows through this region, as does the Río Oja, for which it is known. The territory of La Rioja was formerly known as the province of Logroño for the fortified site around which it developed. The 12th-century church Iglesia de Santa Maria de Palacio recalls its original as a chapel of the administrative palace. The area is particularly famous worldwide for its wonderful wines. Rioja is a wine from a region named after the Rio Oja in Spain, a tributary of the Ebro. 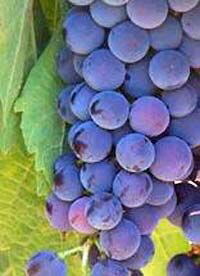 It is made from grapes grown in the provinces of La Rioja, Southern Álava or Navarre. Starting from the 10th century, the region of Logrono was a constant borderland dispute between the Kings of Navarre and the Kings of Castilla. The dispute was finally settled in the late 11th century when Henry I of England awarded it to Castilla. During the Peninsular War, La Rioja was taken by Napoleonic forces and the region stayed in French hands until 1814 when Constitutional Cortés declared La Rioja as an independent province at the time of the Liberal Constitution of 1812. It wasn't until the death of Francisco Franco that La Rioja was finally declared the autonomous community of Spain it is today primarily due to its economic distinction from the surrounding regions. 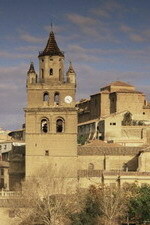 Logrono is the capital city of La Rioja province. The city is the centre of the trade for Rioja wine, from which the region is most famous for. Logrono is quite a modern city built as a river port on the River Ebro that flows through the region. One of the main places of interest will be the Santa Maria de Palacio, the oldest church in the city. It dates from the 11th century and features a tall, graceful, pyramidal Gothic spire with magnificent cloisters and Romanesque features inside. Pilgrims on their way to Santiago de Compostela to visit the tomb of Saint James, traverse the river Ebro over the city's oldest bridge, the Puente de Piedra. The Rioja region in Northern Spain is situated in the Rio Ebro valley, it's northern border being bounded by the Sierra de Cantabrias mountain range and it's southern by the Sierra de la Demanda. The resulting geographical location creates conditions that have produced a perfect environment for vineyards. The Denominación de Origen Calificada Rioja covers some 57,000 hectares located in 3 Autonomous Communities those of La Rioja, The Basque country and Navarra. Between them they produce around 250 million litres of Rioja wine per annum Of which 85% is red and the rest whites or rosés. In 1102 we find the first document making reference to the safeguarding of the quality of Rioja wines when King Sancho of Navarra legally recognized the wines from this area. Then in 1787 the Real Sociedad Económica de Cosecheros de Rioja (Royal Economic Society of Rioja Winegrowers) was established with the sole purpose of encouraging the cultivation of vines, wine production and its commercial development. In 1902 came a Royal Decree which defined the "origin" applicable to Rioja Wines and then in 1926 came the Consejo Regulador (Control Board) with responsibility to define the designated boundaries of the Rioja region, supervise and issue the "seal of approval", and to recommend the legal action to be taken against mis-use of the name Rioja. In 1945 the board received it's legal structure and then in 1953 finally became officially established from which time it has set out the foundations for a modern and efficient production of these world famous Spanish wines.In 1970 this responsibility was clearly defined thus, "The Control Board shall uphold the Designation of Origin and implement, monitor and foster the quality of its wines." The long history of the production and development of Rioja wines has resulted in a wine of outstanding quality which can confidently stand shoulder to shoulder with many of the worlds finest wines. This was further acknowledged when on April 3rd. 1991 a Ministerial Order granted the category of "Calificada" to the D.O., the first and only wine designation of origin in Spain to attain this ranking. For many centuries wine has been produced in the Riojan area and obviously this lengthy passage of time has resulted in the natural selection of grapes best suited to the area and best able to produce wines of the highest quality. Factors such as soil type and climate play a large part in this selection process but of course the resultant wine is an all important consideration as well. White Grape; Viura, Malvasía and White Garnacha. Most Rioja wines are normally the result of the harmonious combination, in varying proportions, of the different varieties grown in the region and the different sub-areas within them. Rioja wines exhibit much aromatic complexity. They are fresh, with a medium body, a balanced structure, and an excellent bouquet. * Red wines: Classic wines of bright colour with a fresh, penetrating aroma; light in the mouth with medium alcohol content. Tempranillo is the predominant variety used to make these wines. * Rosé wines: Bright pink wines with a strong fragrance. They are light and fresh in the mouth, with medium alcohol content. Garnacha is the predominant variety used to make these wines. * White wines: Greenish-yellow, which can be more or less pale. They exhibit fine aromas and prove light in the mouth with fairly low alcohol content. Viura is the predominant variety used to make these wines. Rioja wines are aged in 225-litre oak casks, with periodic rackings, followed by a further period of bottle ageing. There are over 270 ageing bodegas in Rioja which have a total of over 900,000 casks. The different Rioja wine categories are based on minimum ageing periods, which can vary between 1 and 3 years in casks and between 6 months and 6 years in the bottle, depending on whether the wine is to be a Crianza, a Reserva or a Gran Reserva. 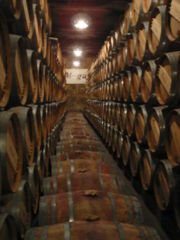 Rioja wines are aged in oak casks of 225 litre capacity with periodic rackings. Then follows a period of bottle ageing. The length of the ageing process differs between different categories of Riojan wine and can vary from 1-3 years in the cask and 6 months to 6 years in the bottle depending on whether the wine is to be a Crianza, Reserva or Gran Reserva. Today there are over 270 ageing bodegas in Rioja with over 900,000 casks. The lengthy tradition of winemaking in the Rioja region of Northern Spain with the inherent wealth of experience that such a period of trial, error, disaster, success and experimentation produces has resulted in blessing the world with a marvellous wine which will satisfy the most discerning palete. A further excellent fact about Rioja, and most dark red wines, is that scientific evidence now tells us that they are positively good for us. Drunk in moderation they provide us with those all important anti- oxidants. One of which in particular, called reservatrol, has been shown to have anti-cancer properties as well as to have an anti-blood clotting effect. Further proof perhaps of the health benefits of the Mediterranean Diet. So now when you take a drink of red wine and say, " your health", you can really mean it. CHEERS!